Here at Ultimate Tinting Essex we provide a premier window tinting service, not only for vehicles but for residential and commercial properties too. We only use the best quality window tinting film so we guarantee the film for as long as you own your vehicle or for 10 years in your home/ business against any material defects. The need for protection against the sun’s potentially harmful rays which has never been greater, especially when you are driving for long distances in bright conditions. Passengers will feel safe when seated in at the back of a vehicle and now with our window tinting service you can keep them cooler and better protected from the harmful UV rays. Window tinting reduces the ability for outsiders to look into the car at passengers, giving the feel of privacy and security. 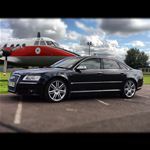 Ultimate Tinting Essex strive to provide an excellent service in terms of quality of work, timely delivery, professional behaviour, customer service and value for money.